10 Technology Trends in Education and Two Big Questions. 1 Education paradigms are shifting to include online learning, hybrid learning and collaborative models. 2 The abundance of resources and relationships made easily accessible via the Internet is increasingly challenging us to revisit our roles as educators. 3 As the cost of technology drops and school districts revise and open up their access policies, it is becoming increasingly common for students to bring their own mobile devices. 4 People expect to be able to work, learn, and study whenever and wherever they want. 5 Technology continues to profoundly affect the way we work, collaborate, communicate, and succeed. What is the biggest road block relating to critical thinking and student learning you face daily? How can we deliver Professional Development to staff so they feel comfortable using the the ten key trends listed above to engage student in critical thinking and student learning? This is a student perspective of 21st century learning at Millis High School. About: "The 21things4students.net project is supported by a grant from the REMC Association of Michigan and maintained by a team from three Intermediate School Districts in Michigan (Shiawassee, Ingham, and Macomb). It was created as an educational and online resource to help students improve their technology proficiency as they prepare for success in the 21st century. This project was specifically developed to provide districts and classroom teachers with resources to help students meet or exceed the 8th grade technology proficiency requirements in Michigan. The development of this resource came at the request of teachers using the initial 21things4teachers.net site." Here is a report from the Digital Wish that was commissioned by A.D, Henderson. We need creative thinker and to teach student to read for meaning. This article talks about this topic and has some handouts to use with your students. We are very excited to announce the release of GradeCam Insight 1.1, the first update to Insight. Our main goal with GradeCam Insight's release in January of 2012 was a product with all of GradeCam Online's features, but with an improved user interface and restructured architecture in order to make it easier for us to improve and adapt the software for teacher needs. Insight has been out for only four months now and this is the first update. We're very excited about the improvements and also that we were able to make them happen in a very short time frame. Our hope is that they will make GradeCam Insight even easier for you to use and allow you to use it in more ways. One of the huge benefits of online software is that you don't need to do anything to access the new features and improvements. As soon as you sign in, they are there for you. No downloading or installing required. Personal setting have been moved to a link at the top right of your screen. We upgraded the user interface for answer keys. You now have the option of changing the "Question Type" on exams. From the answer key you can print forms for customized exams. Multiple Exam versions now allow for aligning with Standards and reporting features are working. When creating forms, you no longer need to select how many ID digits you'd like to use. New York Times and Wall Street Journal best-selling author Daniel Pink discusses motivation and how it relates to student education experiences. This article is wrote on the subject Smartphone vs a Tablet from this person point of view. Please comment what is your thoughts on this subject? Coursera: "Take the World's Best Courses, Online, For Free." What is TED & TEDx? Time lap video of the universe. The link above has many more videos of his work this is amazing. Polar Swirl from Brian D. Ottum, Ph.D. on Vimeo. Strengths: Excellent review and study tool for Spelling and content vocabulary words, entertaining, engaging, and provides immediate feedback for students. Multiple lists can be created and stored - teacher can open or close lists for students use as needed. Many features are offered, even without a subscription. Can be used anywhere there is internet access, and this is an educational alternative that can be used at home. Parents are excited about the app, because now their children can study on a mobile device on the go. Simple tutorial videos for teachers to explain how to use features. Premium subscription allows teacher to track individual progress, keep a grade book, and create assignments. There are no pop-ups, because these can be very confusing for young learners. Students have access to more games and other features like writing and vocabulary. Overall, quite user friendly. First graders were able to access and use the programs without much training or pre-teaching. Weakness: Free Non-subscription: POP-UPS are very confusing and often redirect young students to other sites. Students need to search for teacher's lists, and this takes a few steps. Premium: I wish there was a calendar feature to set to post and close assignments automatically. Sometimes, I forget to open new lists. I would like to be able to have students practice dictation sentences and not just single words. I would LOVE it if the site blocked other activities until assignments were completed, and make the waiting assignment indicator larger and more obvious. Challenges: I would like to explore the other features more - vocabulary and writing. I would like to create content vocabulary lists. Teachers should incorporate time for students to use the program during school, because some students do not have access at home. Opportunities: Writing is a new feature. I would like to explore this more. It would be wonderful to have a way to electronically correct writing and give timely feedback. A. What grade levels: K - 4th, but lists can be customized for older students. However, Spelling practice games may be a bit immature/less challenging for older students. If a teacher is committed to creating and posting lists, it is a useful tool. Subscription is highly recommended for younger students, because of ease of navigation and no pop-ups that look like games. Also, a subscription is needed if a teacher wants to track student progress or use for grading. Lists can be saved without a subscriptions. Personally, I would ask that teachers create lists prior to purchase to increase the likelihood the site will be utilized. Mobile learning is seen by many as a disruptive technology. 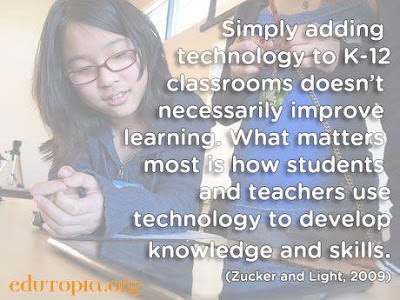 This is because it has been identified as a technology which holds great potential to transform the learning and teaching within a classroom. Wondering what BYOD means or if your school is ready for it? In this 8-minute Pedagogical Quickie, I present some of the many advantages and limitations of this concept for education. 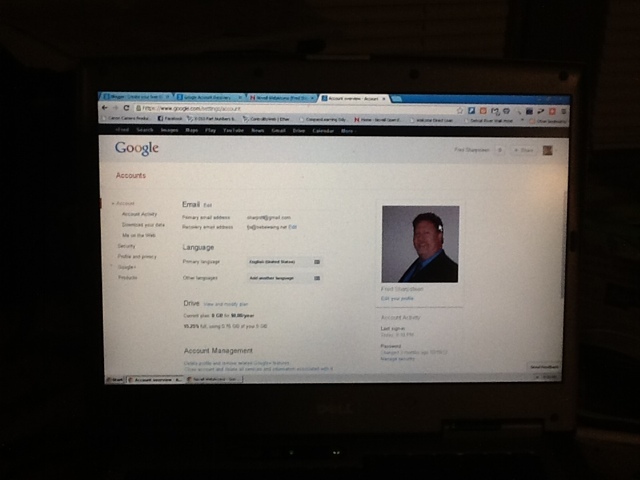 This post is being created with an iPad Blogger app. It allows you to create your blog post with an Apple app. I think this say a lot about technology and how many schools are simply adding to the classrooms. This will not improve student learning. We need to make sure that we do PD with staff so that they understand teacher best management practices when using technology to improve student learning. What is a Google Hangout? this video describes what a Google Hangout and how do you use it. The Death of the Desktop and taking on laptops. This is my prediction of where we are going with computers in education. They are portable and have an interface that is catching on quickly. With Intel cutting back on Desktop technology development. The hand writing is on the wall and we just need to read it. A second factor is looking at the sales of Tablet devices. They are exponentially increasing in sales. There has never been a trend of sales like this in the adoption curve of technology. This is truly a disruptive innovation as talked about In the the book. "Disrupting Class: How Disruptive Innovation Will Change the Way the World Learns" Also so that I am clear I think it will be a mix of operating systems, Android, Apple, And windows and I don't promote one over the other. Read what Bill Gates has to say about education in his 2013 Annual Letter.